One component acid cured, adhesion promoter and anticorrosive primer. Suitable for application over all metal surfaces (galvanized, aluminium, stainless steel, bare metal, chrome). Dilute with thinner (reducer) BODY ACRYL (#740 NORMAL - #741 SLOW) @ 2:1 ratio. Fast drying 45 min @ 23ºC (73ºF ) / 20 min @ 60ºC (140ºF). Suitable for “wet-on-wet: application over brand new panels where filler has not been applied. 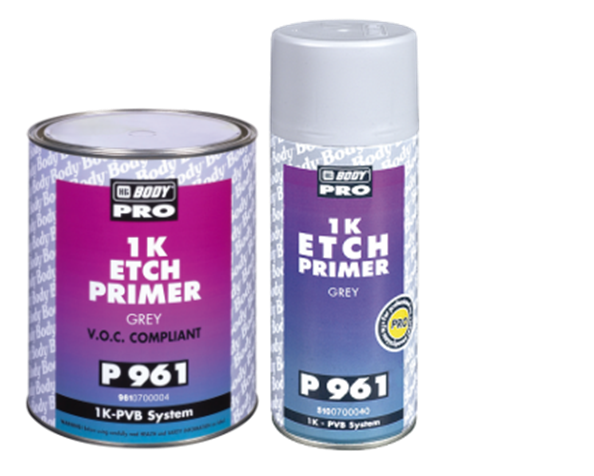 When using over old paint BODYFILL 961 can be used as a filling primer which must be sanded before painting. Adheres nicely to non sanded surfaces and can be painted over with all paint systems.